On 21–23 March 2016 ASU hosted Russian-Japanese Winter Science School, where Saitama University students and lecturers participated. Altai State University and Saitama University started collaborating actively in 2015. The delegation from Japan consisted of two professors and six students, who mostly represent natural sciences. 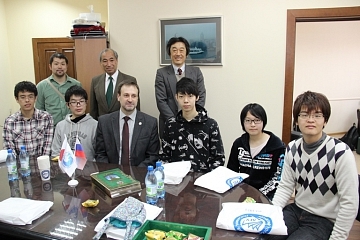 The main purpose of the visit was strengthening cooperation between Russian and Japanese students and professors. Both Japan and Russia support the idea of globalization and integration and intend to establish fruitful collaborative relationship. Saitama University is interested in Central Asia, especially its Russian part. In its turn, Altai State University is aimed at cooperation with Asian universities. Despite the fact that some certain scientists of ASU and Saitama University have already been collaborating for a number of years, these two universities have only established active cooperation in 2015. ASU scientific departments’ supervisors have recently paid an official visit to Japan, and this time the delegation from Japan has come to ASU. High level of scientific training of Saitama University students is proved by the fact that in 2015 its alumnus Takaaki Kajita together with Arthur McDonald was awarded a Nobel Prize for the discovery of neutrino oscillations. The program of the school was organized taking into consideration their interests and involving cultural activities at the same time. It consisted of three days, which were rich in events. On the first day, 21 March 2016, the delegates from Japan visited ASU Historical and Archaeological Museum and ASU Scientific Laboratories. On the second day, 22 March 2016, the guests visited the Asian Universities Association Museum. Further they met the university’s activists, introduced themselves and shared their major scientific developments and projects. Thus, Saitama University current and prospective students showed their presentations concerning different topics and scientific areas, such as mathematical estimation of the probability of 100 bad cannons gaining a victory over 1 good cannon or 7 years’ research of plants, their changes affected by external factors and mutations. In their turn ASU students told Japanese guests the information about our university’s life, its customs and traditions. The event turned out to be very interesting and easygoing, the students managed to find a common language with the foreign guests. It was exciting to learn more about their scientific ideas and developments, as well as about the everyday life of Japanese students and pupils. Seminar “Recent results and open problems in ultra-high energy cosmic ray astrophysics” was also conducted. In the evening the Japanese delegation visited the falcon farm. The third day, 23 March 2016, was dedicated to the trip to the Altai Mountains. The Japanese guests were excited to see Altai nature, Katun River, to visit Altai Republic National Museum. The day was mostly entertaining. The guests had an opportunity to have some rest and enjoy the natural beauties of Altai. They especially had fun playing with snow. The main outcome of the Russian-Japanese Winter School is the development of scientific and educational collaboration between ASU and the universities of Japan. The classical university of Altai Krai is also planning to organize a number of events of the same scale, which will encourage further extension of scientific and educational relations between Russia and Japan. View more photos from Russian-Japanese Winter Science School here.